independent housing. Maisonette classified *** on green property of 1600m2. Close to shops and services, 8km from the beach. Spacious (40 m2) ideal for 2 people and 1 child. Linens (bed made), towels, tea towels, table linen are provided, 2 bikes available without tariff supplement. Complete equipment for baby: cot with thick mattress, changing table with bath ..., High chair, bath, bed 1 person can be provided on request for infant ..
1 kitchen / dining area very well equipped (coffee machines: filter and pods; Italian), closed with bay window overlooking terrace (electric blind awning) and garden or blooming roses and lavender. 1 bathroom with shower to "itaIienne" raised WC, electric towel rail. Heating (electric heaters) and electric floor fan. Beach access by the cycle path (2 steps from the house) or shuttle (200 m) in July / August. Presence (discreet!) owners on the site. embellish the stay of tourists. Small area (3m2) bathroom features a walk-in shower with glass shower wall electric towel rail, a raised toilet, vanity unit with storage drawer, mirror with 3 adjustable spotlights. There could not be a guest accommodation better stocked, more well thought out and welcoming than Marie’s cottage. Outdoor patios w/ tables and chairs, privacy, lots of room to move in the kitchen, a large fridge and stove, washing machine, upgraded lighting—we fell in love w/ this place and with Marie and Christian! 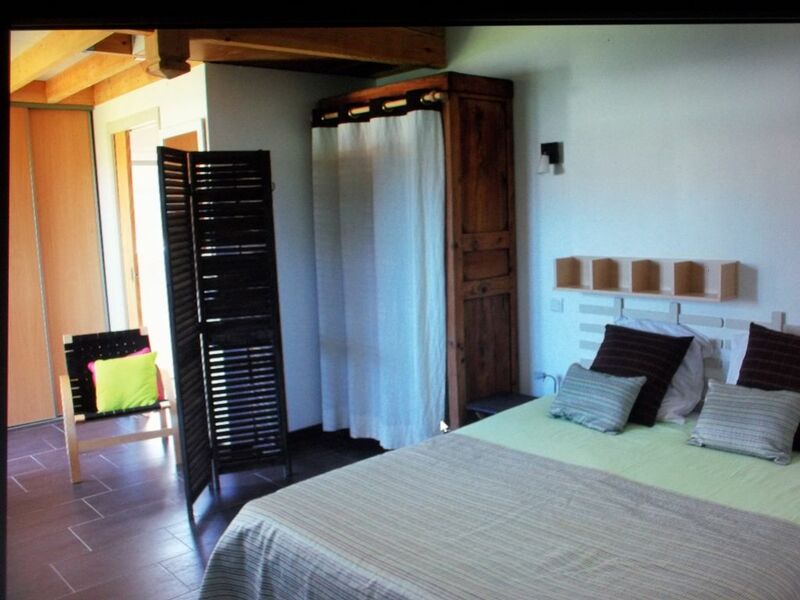 Delightful little cottage, well equipped with plenty of space, very comfortable bed and very clean throughout. the owners were lovely, really helpful and friendly, nothing was too much trouble. We spent a lot of time in the cottage as it was so relaxing but we also visited the beach daily and found early mornings to be best as it gets very windy in the afternoons. Good supermarket around the corner so we ate well. In all a very relaxing week. We would stay here again, excellent. Nette Unterkunft, gut ausgestattet und sehr freundliche Gastgeber! Uns hat nur die Lautstärke durch die Straße gestört. Prettige ontvangst, compleet en netjes ingericht, privé, goed bed, leuk tuintje & terrasje. Que dire qui n ait déjà été dit? Si vous cherchez un petit chez vous, à la campagne,avec l océan vraiment tout près..foncez! Et si vous avez en plus un bébé ou un enfant en bas âge, ce gîte est vraiment fait pour vous! St Julien est parfaitement situé. Le gîte est parfaitement équipé, et décoré avec soin. En plus de l équipement de la maison qui est très complet, tout est fourni pour un bébé, vous pouvez voyager léger. Les propriétaires sont vraiment charmants, jamais intrusifs. Le jardin avec les terrasses est top. A l intérieur, le grand lit est vraiment appréciable. Il est vraiment très agréable de loger dans un gîte comme celui-ci, on s y sent vraiment bien, c'est un vrai petit chez soi..et quand on le quitte on se demande quand on pourra y revenir! Merci aux propriétaires, qui d'un ouvrent grand leur porte aux bébés et jeunes enfants -ce qui n est pas si fréquent-; et de deux ont pris la peine de faire un gîte qui n est pas simplement un endroit où l'on dort et dans lequel tout est a minima.. Between Biarritz and Arcachon on the edge of the Landes coast village of St Julien en Born is proud of its resort: Contis. With its lighthouse in inland surf spots and International Short Film Festival in June. Fame Contis is second to none! The curious will explore the nature of the 'country' within not more than 90 km: the Basque Country, Spain to the south, the Dune du Pyla north, not to mention Marquèze and train the Chalosse Museum or Lady of Brassempouy ... Appointments 'discoveries' are bound. Classement +++ taxes de séjour prélevées par la plate forme ABRITEL Réservation possible 2 nuits minimum :42€/nuitée HORS SAISON ESTIVALE (du 15 juin au 15 septembre) 2 bicyclettes à disposition gracieuse Draps housse de couette serviettes de toilette torchons fournis sans augmentation tarifaire.